Have you heard of St. Baldricks? The St. Baldrick's Foundation is a volunteer-driven charity committed to funding the most promising research to find cures for childhood cancers and give survivors long and healthy lives. Recently, I was contacted by a fan of Paper Makeup Stamps, Sarah Williams and she told me the story of her friend. Her friend has a boy named Oliver. Oliver has an inoperable brain tumor that is terminal. 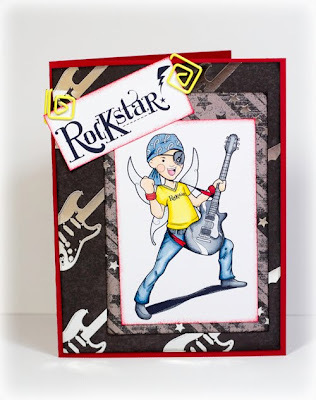 Oliver wears an eye patch so that he does not get double vision, but being the trooper and fun little guy that he is, he eye patch sports a guitar and the words, ROCK N ROLL! He's a kid after my own heart. And indeed, his story has touched my heart. There are so many young ones fighting cancerous diseases, and St. Baldricks is truly making a difference! I approached Diem about making a fairy just for Oliver with all proceeds of the digi sales going to the St Baldricks and/or family for Oliver. She loved the idea and not only drew the perfect fairy for Oliver, but also an awareness ribbon and the word Rockstar! This digi set is $4 and you can purchase it here. And here are 2 cards I made using this digi set! And why are we releasing this stamp today of all days? Because today, Sarah has commited to to shaving her head to raise money for this charity! You can check out Sarah's commitment page HERE! Sarah, we are so very proud of you! Any time you release a charity stamp, you can bet I'll be there to support you and whichever cause you are there to help. When it comes to kids with cancer, well, you know how evil I think it is. No child should ever have to go through that, and no parent should ever have to sit by, helpless. I've already bought my set for Oliver. Thank you, again and again and again, for being so willing to give of your time and your company to help. You are an amazing person, Katie. What a great set, Katie!!! 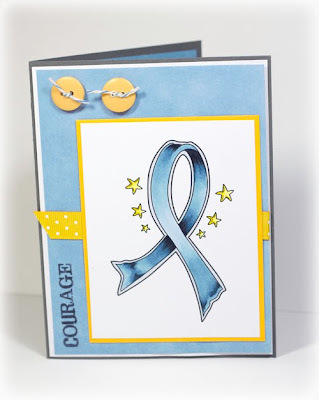 Love the fairy and the ribbon!